On 26th September, I attended Crossref LIVE in London, one of their series of local outreach meetings. These are aimed at “the whole community, welcoming publishers, librarians, researchers, funders, technology providers, and members alike to share their thoughts and to find out more about who we are and how to get the most out of Crossref”. Organization Identifier Working Group – we’ve got persistent identifiers for objects (DOIs), people (ORCID iDs), and this is next piece of the puzzle. Organisation identifiers are a different type of problem from person iDs – organisations can merge, split, go bankrupt and reinvent themselves, have legal entity names often different from common names (e.g. “Harvard University”, formerly “Harvard College”, formally “The President and Fellows of Harvard College“) so the data model is harder. Outputs from this project will be open. The organisational iDs dataset will be around 75,000 iDs – much smaller than Crossref, ORCID, and Datacite are used to! Most likely use case is providing controlled vocabulary for organisation names (institution lookup). No hierarchy info so can’t link a departmental entry to top-level entry for an organisation. Can compare affiliation matching – search across grid.ac, Open ISNI, Wikidata and others and see results from each. It even works for collegiate universities e.g. Jesus College will find matches for Oxford and Cambridge. Why didn’t this project use Ringgold as a starting point? Ringgold is proprietary and didn’t give Crossref the whole dataset, but there is some representation of it in Open ISNI. Looking to tell a broader story about the point of richer metadata. Many publishers didn’t know what metadata they were giving Crossref as they had outsourced that responsibility. The participation report above shows how much is being contributed in terms of: funding information, award numbers, license URLs, preference lists, full-text URLs, ORCID iDs, Crossmark data. Encourage publishers to engage with data sharing. Richer: Richer metadata fuels discoverability and innovation. Connected: Connected metadata bridges the gaps between systems and communities. Reusable: Reusable, open metadata eliminates duplication of effort. Join the growing numbers of advisors and advocates for Metadata2020! What do people do with Crossref metadata? Search, discovery, mining services. Crossref metadata is used all over the world, with particularly rapid growth in Asia Pacific. Bbibliographic management software also uses Crossref metadata. Authorea, Pensoft, ARPHA, and RIO Journal all use Crossref API for “cite while you write” functionality. Other uses include library systems, manuscript tracking systems, scholarly sharing, specialist subject databases, author profiling tools. Jure used an effort vs impact quadrant to sort e.g. high impact/low effort = things to be investigate. Clear that any successful projects would involve considerable effort and many stakeholders. See the live demo of events flowing through Crossref Event Data (I could watch this for hours). The meeting concluded with discussion, data, and drinks. Thank you to Crossref and all the attendees for a lively and thought-provoking event! Have you ever followed a link only to find a 404 error instead of the page you wanted? This is called link rot. Where content “lives” on the internet can be unstable for a number of reasons, such as removal of content, website restructuring, and changes to domain names (hello SAGE Journals and Oxford Academic (OUP) who both have migrations in progress at the moment). Alongside link rot, trust and authority control (establishment and maintenance of consistent forms of terms) can be difficult to establish on the web. An ORCID iD uniquely identifies researchers – here is my ORCID iD. ORCID stands for Open Researcher and Contributor ID. Bibliographic identifiers such as ISBN and ISSN have been in use since the 1970s. As ISBN is to a book, DOI is to an article, and ORCID iD to a person. Your ORCID iD connects with your ORCID Record that can contain links to your research activities, affiliations, awards, other versions of your name, and more. You control this content and who can see it. Sign up for an ORCID iD today! OAPEN-UK was a collaborative research project gathering evidence to help stakeholders make informed decisions on the future of open access scholarly monograph publishing in the humanities and social sciences (HSS). The final report of this project was released last month, and I recommend reading the full document. It is a thorough “state of the nation” report on the current landscape of OA in relation to monographs in the field of Humanities and Social Sciences (HSS), and I found many quotes which I’ve collated here both as my own record of what I’ve learned, and hopefully to encourage more people to read the report and discuss it with others. 19 Researchers seem happy to give up their royalties in the pursuit of open access as long as publishers will do the same with their profits – this probably aligns with the view, expressed by the majority of respondents to our 2012 survey, that publisher profits should go back into supporting their disciplines. 24 Researchers are often suspicious of initiatives from the university’s central management and can be unwilling to engage with new ways of doing things, especially where they believe them to be a distraction from their core business of doing and communicating research. Particularly evident in, for example, the slow uptake of the research management systems that all three case study institutions were implementing, it has clear implications for the introduction of open access mandates. 24 There are also large numbers of researchers – especially early career and retired academics – who do extremely valuable research which deserves publication but who work outside academic institutions. I know a number of people in this situation, who have a need to read and use research information but no legitimate route to access it. 26 Other developments in research policy and management show that changes need to work alongside institutional priorities and ethos in order to stick. It follows that good practice in one institution may not translate easily to the rather different context of another one; the “good” element of the practice will certainly depend – at least in part – on how well the change fits with existing notions of what the institution should do and how it should behave. 26 What works well for implementing open access monographs in one context will not necessarily be effective in another. 27 The institutional case studies reveal a tension between researchers and central departments. It coalesces around areas where researchers are expected to change or add to their administrative practices in order to support the efficient operation of the university. 28 The increasing competitiveness of universities sits uneasily with their traditionally collaborative working practices, which will affect possible joint ventures such as university presses and centralised or subject repositories. 28 Institutions may be keen to show leadership on open access, but do not want to risk getting too far ahead of the curve. 34 Like institutions, publishers have a strong sense of their identity. Their mission and values inform the way they think and talk about open access, and any plans for introducing open access monographs will need to sit well with the publisher’s sense of itself. On a more practical level, a publisher’s other areas of business also affect the way it approaches open access for its monograph lists. 35 Open access needs better metadata for discoverability and usage, but metadata is already a known challenge for e-books. 36 Figure 14: Learned society membership – 33% are not a member of any learned society – has this membership declined recently, or have there always been a large minority of academics who have no affiliation to a learned society? 39 Those with smaller budgets are more concerned; funding spent on publishing an open access book is no longer available for research (the view that publication charges are part of research costs is not universally held). 39 Drivers behind moves towards open access often seem similar across funders but, upon investigation, they are subtly and importantly different. 40 Funders say that policies and business models must also allow for researchers’ continuing attachment to the physical book. 42 Researchers and publishers, in particular, were very keen to stress the complexity involved in writing and editing a book and the importance of flexible timescales when writing. 43 Universities and funders told us that they prefer to close grants when the research finishes, at which point many books will not have been conceived, let alone written and accepted for publication. Furthermore, a researcher’s ideas about how and when they want to publish could change significantly over the period of the project, making it difficult to build publication costs into their budgets. 48 Authors stress that editorial support is a very important factor in their publishing decisions. The publishers we spoke to understand this and agree that the business model by which a book is published – open access or traditional – must not affect the editorial work. Overall, this is the area of publishing where interviewees from all sectors feel there should be little or no change in a move to open access. Indeed, most stress that it is essential for policies and processes related to editorial conduct to remain exactly the same if open access is to be credible. In particular, decisions about whether to publish a book must be taken without any reference to an author’s ability to pay for open access. In other words, the open access option should not be discussed until after a book has been accepted for publication based upon peer review in the traditional way. 49 … publishers feel that marketing and promotion of open access content will need a different approach. Monograph marketing currently tends to focus on librarians as the main purchasers of content and the most common route to readers, even though this may not in fact be the case. 49 Where open access business models involve purchasing of alternative formats or premium versions, librarians will remain an important audience but the way that they are approached will need to change. 50 Open access may also present an opportunity for authors to do more promotion within their communities. Some researchers feel they already do a lot of this; sometimes perhaps more than they should have to. But interviews with authors whose titles were made open access through the OAPEN-UK project suggest that many remain uncomfortable with what they see as “self-promotion” on social media. 53 Librarians are, on the whole, happy for their institutional repository to be the main long-term source of open access monographs produced by their own researchers, but they also support a joint central repository for open access books. The role of copyright libraries [libraries of legal deposit] also needs to be clarified. 54 Researchers are clear, and publishers understand, that open access should not affect the production quality of a monograph. This is important for authors (who still like to receive a print copy of their work) and also for the credibility of open access books as they begin to move towards the publishing mainstream. Some researchers in the humanities and social sciences remain suspicious of books that are only published electronically. 55 …majority of sales and usage [of monographs] comes from third party sites – library vendors, e-book aggregators, retailers such as Amazon, and Google. The metadata challenges, described in the section on content management and preservation, are part of the problem. In addition, many third party suppliers simply are not set up to deal with open access content. Some are not able to offer a zero price to end users. Others operate blanket digital rights management (DRM) across their platforms, which means that usage restrictions are applied even where licences do not require them. Publishers, too, can struggle to promote an open access copy of books on websites that are built to sell. 56 Institutional and subject repositories are another route for discovery and availability of open access monographs. Books published under the more usual open access licences – Creative Commons, for example – can be freely shared and therefore posted within repositories. But where publishers have developed their own open licences, the issue becomes more complicated. Lack of clarity about how universities should deal with a non-commercial clause may also lead to problems. 57 In an open access world, we expect online usage to grow as a proportion of the overall figure. 60 … without complete control of their systems, organisations can find it difficult to implement changes that are needed for open access monographs. 61 Many organisations create manual workarounds. Publishers in particular have to do this for open access monographs, leading to problems when global changes to the system (from within or outside the publisher) override the changes that support open access books. Universities may create or commission programmes or bits of code to help non-interoperable systems work together; this can work quite well but is not scalable and such work needs to be repeated every time the external system is updated. 66 Publishers asking a funder or institution to support the costs of open access monograph publishing (either through an upfront charge or by continuing to pay for alternative formats of the book, or both) must recognise that those funders or institutions will have an interest in understanding whether they are getting value for money. We recognise that publishers need to protect their commercial interests so they may not always be able to disclose as much as their customers might like. The environment for open access monographs moves fast and in unexpected directions. Be flexible with your objectives and keep reviewing what you can realistically expect to achieve. Address challenges as they arise; collaborate to find the best available workarounds rather than seeking a perfect solution. Accept that you cannot control what third parties such as aggregators and book vendor platforms will do, even though they will almost certainly make changes that affect your activities. Make somebody responsible for open access monographs and set aside some of their time so they can work on it. Be aware that changes inside your own organisation may affect open access monographs and you need to be prepared to recognise them because people will not necessarily think to tell you. Wide and open-minded collaboration can enhance the effectiveness of your work. It is impossible to see the whole picture at the beginning of the project and only by getting started will you uncover challenges. Individual books have their own sales patterns which can be quite unpredictable, so it is difficult to draw conclusions based on small samples. We are in an environment where open access monographs are uncommon and any findings from projects or experiments will reflect that. What do we want? / Gradual change! / When do we want it? / In due course! 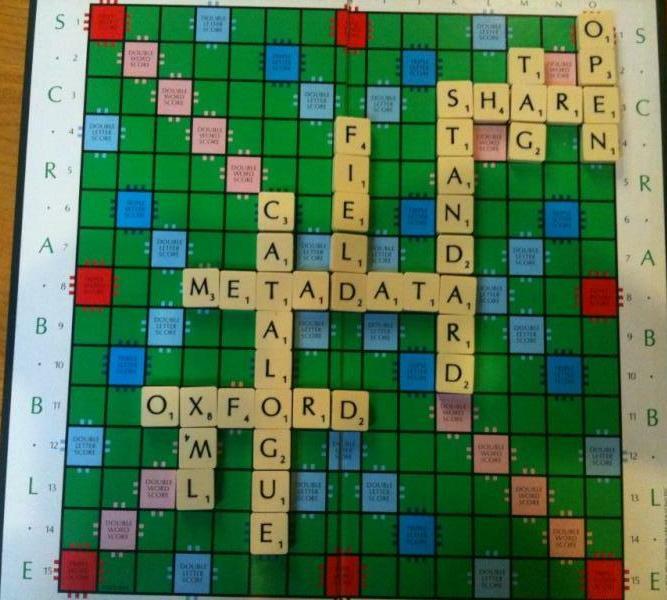 I recently attended a day conference organised by the Bodleian Libraries, entitled “From ‘cataloguing’ to ‘metadata’? : resource description and subject classification in a digital age”. I tweeted from the event using the hashtag #bodmetacat. In the summary below, I have included contributions from others – attributed by their Twitter IDs. Library response so far includes evolution of catalogue & change in interfaces. Is the OPAC dead? Vendors aim to profit from services based on data rather than data for its own sake?